The China Millennium Monument Museum of Digital Arts opened last Saturday. Among the installations — Eyjafjallajökull by AntiVJ (Joanie Lemercier). "Painted directly onto a large wall, a wireframed scenery is slowly revealed by gentle light effects. The audience’s sense are progressively challenged as optical illusions question their perception of space." Here's a video on the construction of the work for the onedotzero festival at EMPAC in upstate New York. 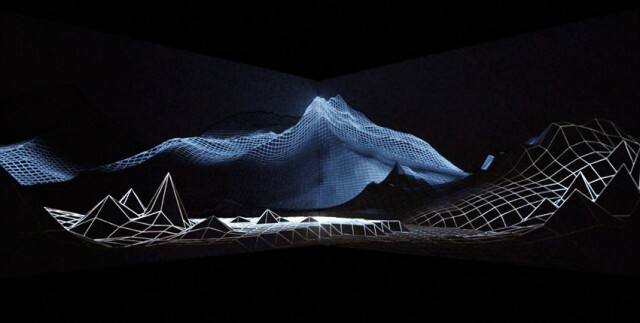 The artist tells Creative Applications, "The original plan was to fly to empac to do a 3 weeks residency, to develop a new project from scratch, which would involve projection mapping onto objects, a sound track by minimal techno producer Sleeparchive, and potentially a live performance on the day of the opening. As the video explains, the original idea and schedule felt apart when the volcano erupted, and the 3 weeks long residency turned into just 5 days on site, to setup the installation and prepare a live performance…"
Awesome. I was at EMPAC for the original setup. So dope.